Dayak is ethnic group on the Borneo island. This ethnic has a batik which also often referred to as Dayak Batik. In some areas, this batik is including the popular batik and many tourists both domestic and foreign tourists who collect this batik. Dayak Batik has the uniqueness of motif bold and very depict cultures. In addition the use of color is more attractive and very courageous so as to make the wearer the center of attention. However, the colors of the batik here are mostly bright reds, yellows and greens — in stark contrast to the subdued colors of Central Java. The batik motifs typically use sacred symbols, such as wooden shields and hornbills with sharpened and curved beaks. 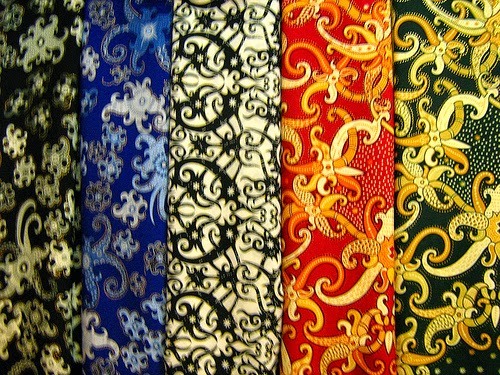 Bright reds, light yellows, pinks and greens were the most popular colors for local batik buffs. The manufacturing process was extremely diverse, starting with the write, cap, or dye batik technique. Dayak Batik motif is related with the peculiarities of the Dayak cultures. One motif of Dayak Batik is wood pattern which also sometimes resembles to Saber, one characteristic of the Dayak. Unlike other types of Kalimantan batik, Dayak batik fabric is softer and smoother. However, it remains a striking and light color became one characteristic of Dayak batik cloth, like other kind of Kalimantan Batik. Almost motifs that contained in Dayak batik cloth are flowers, shields, homes, and boats.